GB: When did development of Neverwinter Nights 2: Mask of the Betrayer actually begin and what are you shooting for as a release date? Kevin: We first started on Mask of the Betrayer with Atari, Wizards of the Coast, and Hasbro back in July this is when we began to outline the new story. In fact, the astute will notice tie-ins to Mask of the Betrayer in the original campaign. We didn't fully begin development on NX1 (our (designation) for the expansion) until we finished NWN2. We can't really talk about the release date, but I will say that we've already got some of the areas completed and they are looking GREAT. We've been applying everything we learned on NWN2 to get the best results possible. GB: Aside from the usual gameplay additions, do you plan on making any expansion-specific tweaks to the engine, interface, or multiplayer component? We're implementing some expansion-specific gameplay elements that will make Mask of the Betrayer stand out from Obsidian's previous titles and other D&D computer role-playing games. As one example, the passage of time will have important impacts on gameplay. Mask of the Betrayer will also feature major enhancements to the companion Influence System that Obsidian has pioneered through Star Wars: Knights of the Old Republic II: The Sith Lords and Neverwinter Nights 2. Of course, these new elements will be things that the community can modify to their own modules and campaigns if they wish. GB: How does the expansion tie in with the original game's campaign? What events have transpired that will set us forth in search of adventure again? Kevin: Mask of the Betrayer begins almost immediately after the ending of NWN2. You will play your same character (if you wish), continuing his or her story. (Your weapons and gold are gone, but you'll have many of your other equipped items still.) 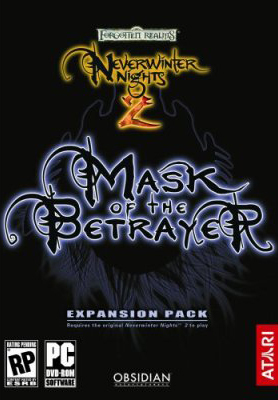 While the story in Mask of the Betrayer is connected to Neverwinter Nights 2, you don't have to have played the expansion the story stands alone, but players who have gone through the NWN2 campaign will recognize some references that occur in NX1. GB: How many more hours of gameplay are you shooting for with Mask of the Betrayer? Will new players have the option to start a character and play through the standard game and the expansion as one long campaign? Kevin: We're aiming for a more focused campaign and a tighter storyline. We expect Mask of the Betrayer to weigh in at over 15 hours of gameplay. NX1 has optional gameplay content, so the exact gameplay time will vary depending upon your choices throughout the game. As for playing through both titles, Mask of the Betrayer is a continuation of the same character's story, so you can play through the core game and the expansion as one long campaign. GB: Are there any plans to introduce any new prestige classes or sub-races? How about epic levels? Kevin: Absolutely! We are adding new prestige classes (and a base class) and new sub-races. We'll be sharing more information on those soon, but we think you'll be excited about our choices. ;) One of the prestige classes is completely new and was designed through consultation with our colleagues at Wizards of the Coast. As far as the leveling goes, NX1 will feature epic levels through level 30.